My dad tents his fingers at the kitchen table. It’s a Sunday morning and we’ve been talking about the recent discoveries at the site of the former Mother and Baby home at Tuam – 796 children buried in a cistern. For him, having grown up in Finglas in the 1950s and 60s, Artane was closer to home. I wanted to discover what was known – how people lived alongside places like these and normalised it. So the normalisation was the usual kind – an othering, the casting of a glamour, the way we look at the high walls of direct provision centres and idly imagine what might go on behind them. The poem I wrote in response to this conversation is published in today’s Irish Times. I’d like to dedicate it to my dad Anthony, and his dad Noel. the sight of my own legs, dangling. green and vast, the distance of it. that rushed in from the bay. 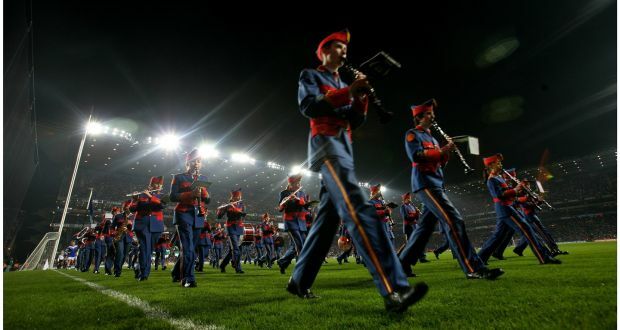 The bold boys of the Artane Band. Over the past two weeks I’ve had the pleasure of having work included in two new anthologies of Irish Poetry. The Deep Heart’s Core from Dedalus Press takes an intriguing approach to the anthology form by asking poets to choose ‘touchstone poems’ that mean a lot to them, and explain the process behind them. The result is a very varied and thought-provoking selection of contemporary Irish poetry. It’s especially interesting to see which poems each poet selected. You can buy a copy here. Washing Windows? Irish Women Write Poetry is an excellent anthology of contemporary Irish women poets, published by Arlen House. It’s great to see such an extensive anthology recognising the excellent women poets working in Ireland today. Arlen have long been a champion of women’s writing in Ireland (when it was neither profitable nor popular) and long may their good work last. The book is available to buy from Books Upstairs and online here. I got a lovely surprise this evening to discover that my poem ‘Hamelin’ from my collection Liffey Swim is this week’s poem of the week 0n RTE.com, nominated by the Poetry Programme. In fact, I was so excited when I found out that I treated myself by turning on the heating a full ten minutes early. You can hear me reading the poem here, along with a review of Liffey Swim by Philip Coleman of TDC.